Nokia Lumia 720, one of the most elegant and great value mid-range Smartphone of 2013, is now available in Nigeria. Nokia Lumia 720 offers some of the best features of the flagship Nokia Lumia 920, but comes at a fraction of the price. You can buy Nokia Lumia 720 online at Nokia stores and reliable online stores in Nigeria. Nokia Lumia 720 is a beauty. It comes in a sleek unibody design, just 9mm thick, making it slimmer than the flagship Nokia Lumia 920. It features brilliant 4.3-inch super sensitive touch display with 800 x 480 pixels (WVGA) resolution and Corning Gorilla Glass 2 protection. Nokia Lumia 720 features a great camera; a 6.7MP camera on the rear side with 720p HD video as well as LED flash, Carl Zeiss optics, and autofocus and a 1.3MP camera on the front-end with wide-angle and Skype HD. It runs Windows Phone 8 with Microsoft Office and Nokia apps like Nokia Music, Here Maps, Here Drive, Here City Lens and Here Transit loaded. Nokia Lumia 720 offers fast 3G data with internet speeds of up to 21Mbps. On wireless networks, the smartphone supports Wi-Fi 802.11 b/g/n. Nokia Lumia 720 also comes with a wireless hotspot feature that enables you share your data plan with up to 8 wireless (Wi-Fi) devices. It also offers wireless charging via wireless charging covers. 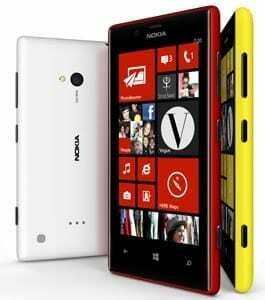 Nokia Lumia 720 is available in Matte, Red, Yellow, Cyan & Black colours and comes with 8GB built-in storage with support for up to 64GB memory card capacity. You can now buy Nokia Lumia 720 online or at a Nokia stores. If you are wondering the features of this smartphone, read our Nokia Lumia 720 article. Nokia Lumia 720 Price in Nigeria currently ranges from N47,000 to N55,000.